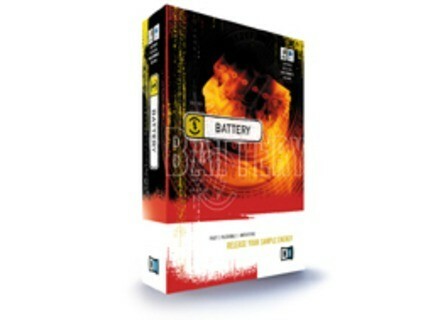 Battery, Virtual Drum Sampler from Native Instruments in the Battery series. This library works on MAC , Windows Xp and 7. No errors found while using it on both platforms , Xp and 7. The manual provided by Native Instruments covers a lot of thematics , important information regarding the program is shared in a classy and easy to understand manner. The general configuration is fairly easy but it requires some time doe to the high size of the product that is primarily 12 GB of samples. The typical functions are easy to access , very good design , amateur friendly. The software works good in its configuration , the level of stability isn't a problem. I'm getting great performances in emulating different groove patterns that sound as close it can be to real drums , powerful drum tool we have here. I've been using it for a year now. What I like most about it , is the library that consists from 12 GB of pure drum samples , the 100 presets kit , a very useful cell matrix that include up to 128 cells. Another great feature of this product is the wave editor, cell-specific time stretching , the humanize functions is also a huge quality and groove booster. You get a better bus effect , some new master effects and different editing features. My opinion about the value for the price is good , very realistic sounding drum pack for a decent price. Precision and quality of the sound is 10/10 , no doubts , one of the most realistic drum packs. Knowing what I know, I would get this product again mainly of its features and sounds. There weren't any kind of compatibility issues with the program , everything works very good on any platform available. The manual that comes with this product has a lot of description and different techniques that can be applied to achieve a certain groove , a certain effect which consists from panning , velocity , playing on off beat , playing on the strong beat with accentuating the kick or the snare. The general configuration and setup is very easy and simple , it doesn't require a vast level of musical wisdom. The software works good in this configuration , everything is well made, designed without any type of bad thinking or habits. The gear and software is very stable and works very smooth and great in any circumstances. What I like most about Battery from Native Instruments is that it's samples based , the library that comes with it is so huge , you have a huge amount of different type of snare to choose from , a huge amount of kicks , which you can layer them in different interesting ways , and of course you have a lot of editing windows that come to be very helpful. What I also like about Battery is that you can't really distinguish a real set of drums from these , they sound actually as close as it can be to the real one , you have different panning positions which allow to create different room effects and grooves. Another thing to mention is that this is one of the biggest drum libraries out there , and it's one of the most used as well in must studios in the world mainly because of the high quality of the pack. Precision and quality of the sound I would rate 9/10. Knowing what I know, I would get this huge pack of different styles of drums from Native Instruments. it does not take too many resources in short it is perfect. I used the last 3 months and not a single crash. My favorite is the c cot practice software ==> we need a sound about the midi track ==> it is enough to go on battery and do a drag and drop a couple of easy adjustment on the and c is one shot left, we did more than that is sequenced in cubase. report quality price ==> ok == "in addition the quality of samples provided with is impeccable. Installing high-speed and no problem! During the first use, you must put the installation CD into the drive and voila! battery is ready. The manual is clear and well done, with the added advice on the mix of parts and rhythmic on the choice of samples, bravo! I just worth buying but it is easy to use trs trs, trs intuitive. I think the interface is well done, it allows to realize in a flash the CHARACTERISTICS of the kit loaded. At quality price ratio, I find that battery alone is a fair bit, the kits come with are nice but there's nothing to marvel, for cons coupled with the cd studio drums Native Instruments also. .. adchire! !